The Chalk Of The Town this week comes to you from Pune, India. 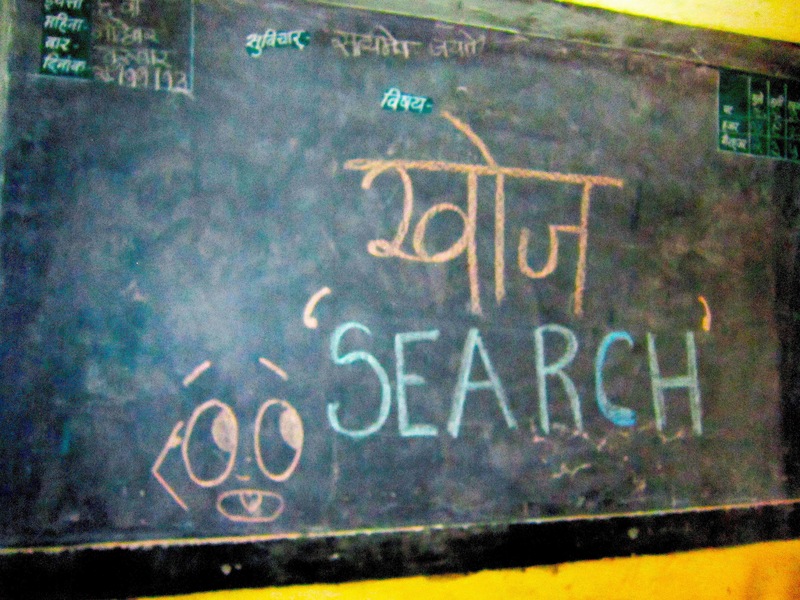 It is the word ‘search’, translated written both in English and Hindi by Sumera Deane. “The school is called Ahilyabai Holkar School. It is run by the PMC (Pune Municipal Corporation) for mostly the children of the police. They come from villages around the area like Sus Gaon, Baner Gaon and Aundh. They come from violent and poor backgrounds. Teach For India has four fellows who are working towards giving these children a sound education that does not just help them pass exams, but also helps make them well-rounded people, while emphasising the value of education. They focus on learning their own languages and English in order to participate on a global scale. They do have uniforms. However, the children who come from very poor families have safety pins for buttons, shoes with holes and trousers two inches above their ankles. It’s all very sad to see, but most of them want to be educated and so they put aside these difficulties. They are happy here. The school follows a very old style of teaching, and the TFI fellows are slowly changing that. Chalk With S: What’s an Equality? It is an interesting moment for me to talk about equality. I have spent the last few days holding my breath and grieving for Nairobi, for everyone suffering at the hands of those who do not believe in respecting differences. While this was especially close to my heart, every day, all around the world, such tragic incidents occur, demonstrating the need for an understanding of diversity, and an appreciation of the same. When I discuss these issues with others, I often use the word ‘equality’. I stopped chalking immediately and joined her in staring at the characters I had been drawing. This question I had not anticipated. It was my turn to consider. How could I explain this word without using a zillion other complicated words, and convey its meaning to this child, who was looking expectantly at me? Without being able to Google, “how can I explain the word equality without using a zillion other complicated words and convey its meaning to this child who is looking expectantly at me”?! I offered, after what I hope was not too long a silence, “equality means being nice to everyone even if they are different in some ways”. She responded “oh”, and nodded, processing my explanation and staring a bit longer. I talked a bit more about how different ideas are needed for the conversation on social equality. Perhaps the essence of a word can get lost in complicated language at times. Jargon, and words frequently associated with the key word are used, but the underlying message the word seeks to convey can be obscured by a haze of complex terminology. 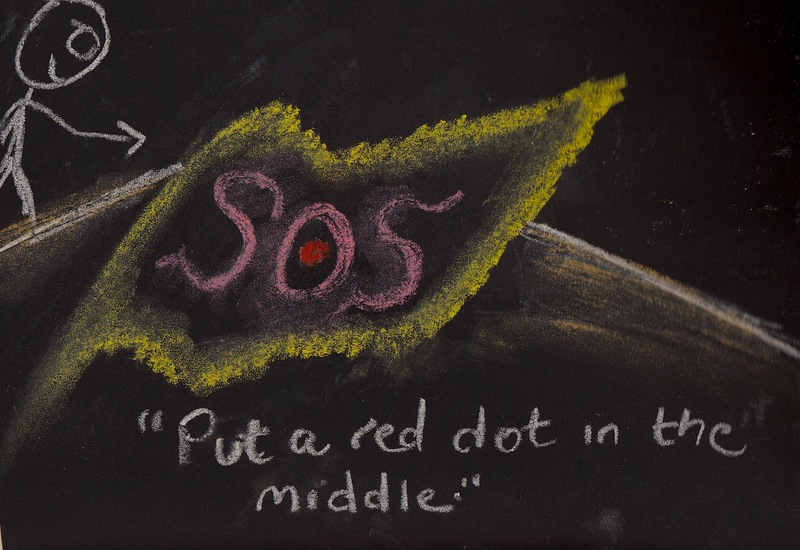 While exploring various meanings and aspects of a word is important to avoid generalisation and oversimplification, sometimes a back-to-basics approach can work to make the message accessible to more people. The question I was asked also forced me to evaluate my own actual understanding of the word, how much more I have to learn about it, and how the world needs to get better acquainted with it. My two days of doing artwork out on the street at the Victoria International Chalk Art Festival was an experience I expected to be interesting but slightly uncomfortable. The idea of being watched as I drew was intimidating. I thought I would much prefer completing the painting in secret, preferably by at night by torchlight, before everyone got there, so I could then disassociate myself from it if it did not appeal to them. What I had not expected was how much I would enjoy talking to visitors and being confident enough to continue working as I talked. 1. Telling people about CWM: I had hoped that people would notice our t-shirts, cards, flyers (in addition to the painting itself), and ask us about the project. I am happy to report that this happened, and we were able to share our idea. 2. Hearing about artists’ experiences: Heidi and I talked to several artists about how long they had been chalking. 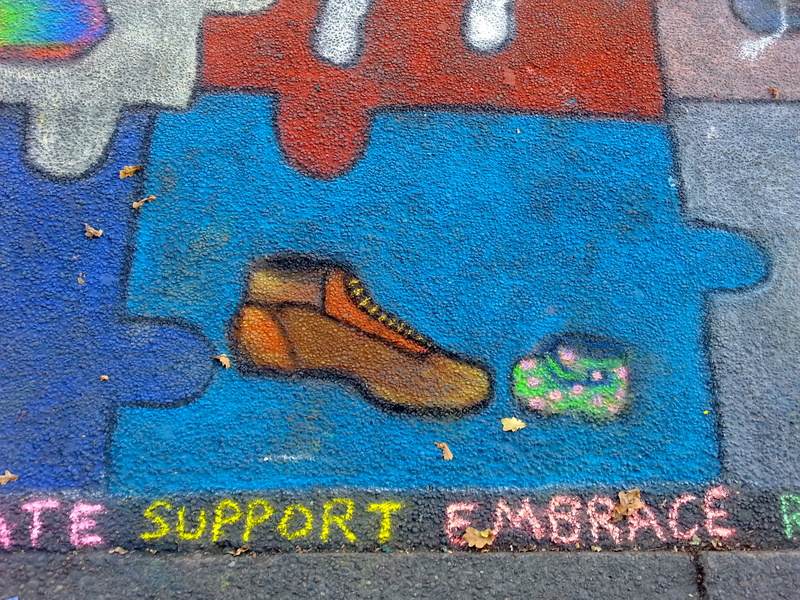 To some, it was a new medium, but many around us do this for a living and have been chalking for many years. This was the biggest learning moment for me. While I chalked many younger people came up to me to ask what was going on in the picture. I had seriously underestimated the interest that our artwork would garner from a younger audience. They were very receptive to the idea, and seemed to grasp the narrative a lot quicker than many adults. Some even said ours was their favourite! What I enjoyed was how genuinely and seriously they considered the story, trying to make a connection between language use and the sharing of ideas. One little girl even contributed to the art. I asked for her input on colour choice, and she even assisted with a little bit of chalking! It was fun giving someone a space to colour in, and that has given me several new ideas about how to get more younger ones involved! 2. Chalking Skills: This is a little obvious now that I think of it, but I had not really thought I would learn much from other artists; I expected them to be busy and professional, but many shared some great tips about chalking, and on street art in general. 3. Bruised knees: again, now, very obvious. The rough, unyielding surface that was challenging to chalk on, but also tough on the knees and elbows, and well, everything. All worth it, though!